This story was first published at Occupy The Social. It was surreal standing in the middle of art walk with two friends knowing that Occupy LA were essentially banned from Spring Street due to a police riot that broke out a month before. On July 12, 2011, the LAPD shot rubber bullets into a crowd of art walk attendees mixed with members of Occupy LA, myself included, because some were writing with chalk on the sidewalks. In an effort to avoid any more injuries from police violence, the Occupy LA General Assembly accepted a proposal effectively relegating all activities related to “chalking” to Pershing Square for the August 9th art walk. Occupy LA also called for solidarity “chalking” actions across the World on the same day. 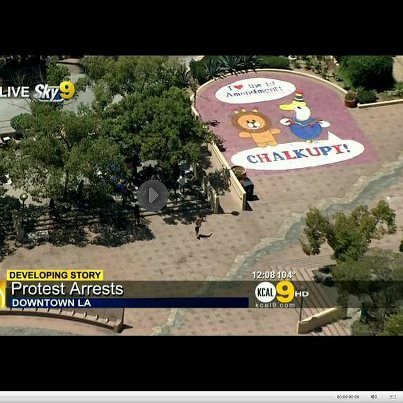 In the week leading up to art walk, the LAPD arrested members of Occupy LA for chalking and other public misdemeanors, while the media published various articles debating the LAPD’s use of a vandalism law to arrest people writing with chalk. Early in the morning of August 9th, the cops detained members of Fresh Juice Party shortly after they finished an enormous chalk mural in Pershing Square. Later that day, the LA Times reported that a fist fight broke out between someone from Occupy LA and a visitor from Occupy Oakland over chalking skills. This only compounded the tensions that were amplified in the media over the LAPD “bracing” for Occupy LA’s return to art walk. “I can’t tell you that. You just have to move” repeated the Sergeant. My friend then asked the Sergeant if it was department policy to allow officers to chew tobacco while on duty, to which the Sergeant replied, “I see we are going to have a problem here.” The Sergeant then got off his bike and spit again. This time it landed a little further from me, but still within a few inches. The situation gives me pause to reflect again on police provocation, testimonies, and cameras. If anyone surrounding me did intervene, the consequences for all could have been tragic. There were no less than 30 police officers in that intersection, some on horses, others on bikes, and many on foot. The build-up by the local media to Occupy LA’s attendance at art walk, like Tyson Vs. Holyfield, put everyone on edge. No one wanted to back down. By spitting at me, Sergeant Bogart could have triggered a much larger reaction that would have provided the rationale for deploying hundreds of extra police to stamp out the vestiges of political speech in Downtown LA. I remained collected enough to walk away with my body intact, but my dignity obliterated. The next day, The LAist wrote that Occupy LA claimed that the LAPD stood down (which they did because there were no arrests in a chalk covered Pershing Square), while the LAPD claimed that Occupy LA backed off (which they did because they did not go to art walk en mass). Importantly, this battle of Los Angeles has nothing to do with the medium of chalk as reported in the media. For the LAPD, it is really about vilifying those already marginalized and legitimating the increased policing of downtown, but for Occupy LA it is about slowing the gentrification of downtown in defense of the very poor. The abundance of police during art walk- and in downtown more generally- has been questioned many times before Occupy LA even existed. In fact, the majority of Occupy LA unknowingly stepped into the debate after the raid on November 30, 2011. For years, the LAPD and The Central City Association’s private security have patrolled art walk to stave off the wayward homeless from neighboring skid row, so that the very poor, with their cries of hunger and untreated open wounds, do not disrupt the roving middle class crowd. Moreover, the art walk crowd is taught to fear skid row as lines of cops audibly warn middle class attendees not to travel far from Main Street. My “Class WARhol” banner was designed to engage intelligent art walk attendees in conversation about the on-going class war in LA’s historic downtown core. I spoke with some art walk patrons who thought the banner was clever, but did not know much the treatment of the very poor in downtown LA. Others knew about the dangers of life on skid row (including rampant police harassment), but did not know that the police typically searched and arrested homeless people from skid row in preparation for art walk. 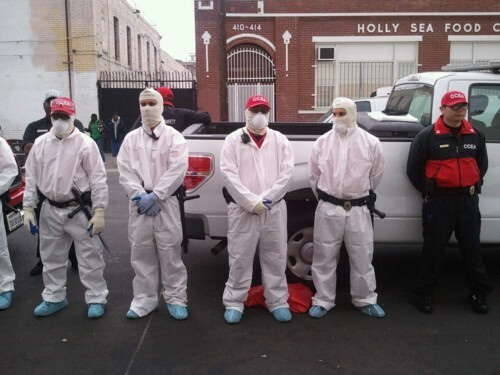 While the galleries are busy washing their walls white to prepare for new art, the LAPD and CCA security are conducting their own kind of whitewash just outside. “Clean streets” in downtown LA does not simply mean removing trash and washing human waste into the gutters, it really implies ridding the streets of poor people and what little they own. Recently, it has come to include removing all memory traces of political speech by erasing the most ephemeral form of expression: sidewalk chalk. In the case of Occupy LA, they are getting lambasted by the police for calling attention to the problems of the very poor. Even more disheartening though, the shifting demographics of Occupy LA over the last 3 months are used to justify the actions of the LAPD – the poor, gay, black, and brown are now at the forefront of the Occupy movement and consequently, they bear the brunt of the attacks from the police. These populations are the favored marks of an institution that derives its own authority by depriving the people of their own power.